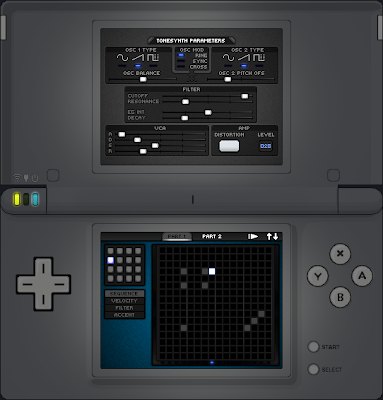 NDS Composer Applications: ToneSynthDS alpha version 04 mockup! ToneSynthDS alpha version 04 mockup! Fixed Filter and VCA positions. Added AMP section, Distortion button and Level Slider. We need to test the level slider. Maybe i need to change it.?!?. (nope :D) The top section is sweet now!! More Contrast needit (font and slider).